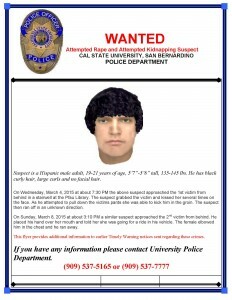 A wanted poster of a suspect who is allegedly responsible for sexual assault and attempted kidnapping near CSUSB’s Pfau Library was e-mailed to students, faculty, and staff on Wednesday, March 11. The sexual assault occurred on Wednesday, March 4 in a stairwell at the Pfau Library. The suspect grabbed the victim and kissed her several times on the face, then the victim kicked the suspect in the groin, causing him to flee, according to University Police. The attempted kidnapping occurred on Sunday, March 8, behind the Pfau Library. The suspect grabbed the victim from behind, placing his hand over her mouth and told her he was taking her to his car and the suspect fled after the victim elbowed him in the chest, according to University Police. CSUSB President Tomás Morales urged students to be careful of distractions and be wary of their environment due to the recent spike in crime on campus, via e-mail. Police are still seeking the suspect’s whereabouts and are asking for the public’s help. 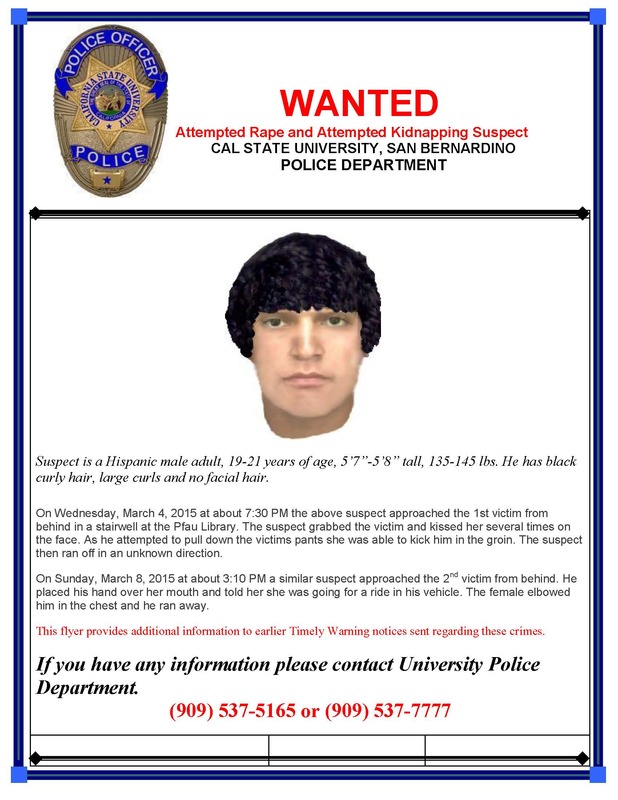 Students are urged to call campus police at 909-537-7786 regarding any information on the suspect. This is very insane; to know I spent 5 days out of the week on this campus. I hope they catch this sick freak soon.